Is your school ready to respond to a crisis? Are school staff ready to address physical safety issues, emotional needs, and mental health consequences that arise from crisis situations? What steps can you take now to prepare your school for a crisis? Use the steps and guidance offered in this book to answer these and other questions critical to surviving any crisis that touches a school. Tens of thousands of school and community professionals have used this model, and you can adapt it to your unique situation. Whether you need to address a crisis in the school building, across the district, or throughout a region, the field-tested model and practical guidelines in this book lead you to answers that form a framework critical to controlling crisis situations. With an emphasis on integrating safety and security plans with mental health services, the authors show you how to use the talents, training, and knowledge of school personnel to coordinate a comprehensive response to any crisis. This model empowers staff to initiate and sustain a response to crises that answers the physical safety, mental health, and emotional needs of students, community, and staff. Sample plans, forms, checklists, and resources jump start crisis training, preparation, and response. 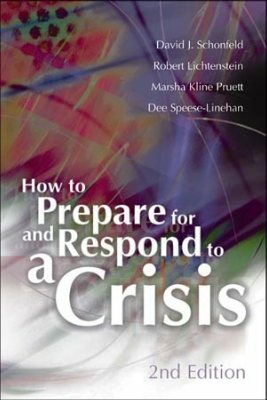 How to Prepare for and Respond to a Crisis, 2nd edition, is based on the work of the School Crisis Response Initiative of the National Center for Children Exposed to Violence, which is part of the Yale Child Study Center. DAVID J. SCHONFELD is associate professor, Departments of Pediatrics and Child Study Center, Yale University School of Medicine, 333 Cedar St., P.O. Box 208064, New Haven, CT 06520-8064. Schonfeld is also program coordinator of the School Crisis Prevention and Response Initiative of the National Center for Children Exposed to Violence. ROBERT LICHTENSTEIN is consultant for School Psychology and School Social Work, Connecticut State Department of Education, 25 Industrial Park Road, Middletown, CT 06457.